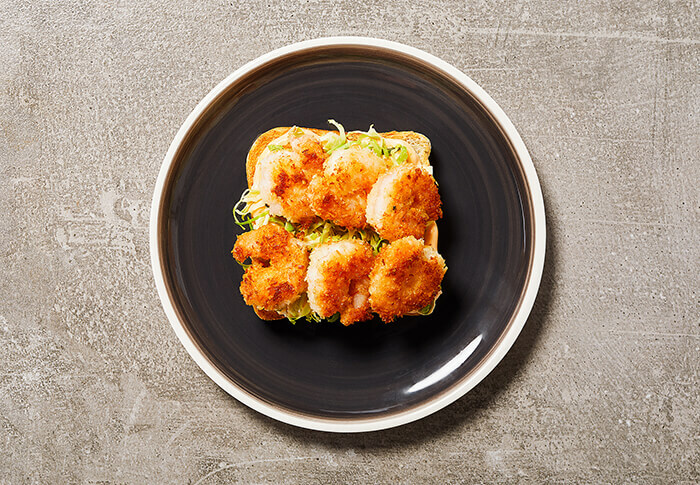 If you feel ready to whisk away your mouth (and mind) on holiday without having to leave the comfort of your own home, then our Crispy Coconut Shrimp and Spicy Mayo Sandwich is just the ticket. This sumptuous and exotic dinner delight pairs sweet and juicy shrimp with a crispy, not greasy, coconut crust all nestled on a flavourful bed of slightly spicy sriracha mayo and thinly sliced, lemony Brussel sprouts. And, like all good things at COBS Bread, this meal inspiration goes from deliciously good to mind-blowing-tastebud-wowing great with the help of fresh bread to top it off. For this recipe, we selected lightly toasted slices of our nutrient-rich, Chia White Loaf. A source of omega-3 polyunsaturates to help maintain heart health, as well as protein and fibre to keep you feeling full for longer periods of time – two slices provide 73% of the daily intake of omega-3 polyunsaturates for women and 50% for men. With meals this inspired, you’ll soon have to reserve a seat at your own dining table. Get things started by visiting your local COBS Bread bakery today. And for more fresh and inspiring recipes check out our Meal Ideas. Sprinkle shrimp with salt and pepper. Add egg whites to a shallow bowl. In second shallow bowl, combine coconut and breadcrumbs. Dip each shrimp in egg white, letting excess drip off. Dredge in coconut mixture, letting excess drip off. Set on plate. In large, nonstick skillet, heat oil over medium heat. Cook shrimp, turning once, until breadcrumbs are golden and shrimp are pink inside, about 2 minutes per side. Set aside. Meanwhile, in small bowl, combine mayonnaise and sriracha; set aside. In separate small bowl, combine Brussels sprouts, olive oil and lemon juice. Spread mayonnaise mixture over one side of each piece of bread. Arrange Brussels sprouts mixture over top of two of pieces of bread. Top each with 6 shrimp. Close each sandwich with remaining pieces of bread, mayonnaise side down.